Explore la fascinante historia de la Toscana y sus numerosos gobernantes en una excursión privada desde Livorno. Viaje en un vehículo privado a la ciudad fortaleza de Lucca, una de las gemas menos visitadas de la región con raíces que se remontan al Imperio Romano. 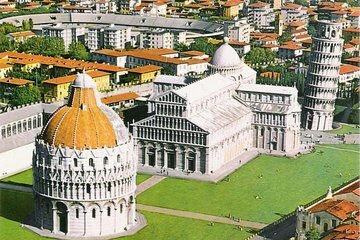 En Pisa, admire las maravillas arquitectónicas de la Piazza dei Miracoli e incluso suba a la famosa Torre inclinada de Pisa, si lo desea. Disfrute de un itinerario flexible y la atención indivisa de su conductor y guía. This trip was excellent. I managed to book the first tour up the Tower in Pisa and our guide Roberto met us on time and made sure that we got to the Tower in plenty of time, he also showed us where to line up for the climb. After we climbed the Tower he took us to some other beautiful old buildings before we left for Lucca. Lucca was a very nice place to visit and we had time there to go up the Tower, see the Leonardo da Vinci exhibition at the San Cristoforo Church, the markets etc before Roberto took us to a very nice restaurant for lunch. After lunch Roberto drove us around the beautiful mountain area near Lucca. Roberto was an amazing guide and made sure that we had the best day.